Lewis Hamilton's world championship lead was slashed to just four points after the McLaren star retired from a dramatic Chinese Grand Prix. The Englishman slid off the track on his way into the pit lane to change his tyres in a tricky wet-dry race. 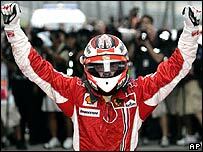 He had already ceded the lead to Kimi Raikkonen's Ferrari and was being pressured by team-mate Fernando Alonso. Raikkonen won from the Spaniard - and they will stage a title showdown with Hamilton at the final race in Brazil. Hamilton leads with 107 points, ahead of Alonso on 103 and Raikkonen on 100. Hamilton had led from the start on a damp track and appeared to be on his way to a second brilliant victory in a week following his triumph in Japan. The 22-year-old had a lead of more than eight seconds when he made his first pit stop on lap 15 of the 56-lap race. That was cut to four by Raikkonen by the time the Finn had made his stop four laps later, but Hamilton still appeared to have the race under control. The Briton's hopes started to unravel as the track began to dry a few laps later. After his early burst of pace, his tyres started to wear out quicker than those of his rivals. Raikkonen quickly closed in on Hamilton, who held his title rival off for two laps before falling foul of his lack of grip. 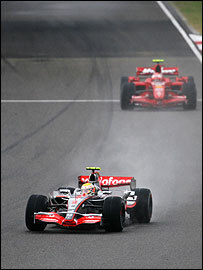 The McLaren ran wide going into turn eight on lap 29, allowing Raikkonen to sneak past on the inside at the next corner. And then it all went wrong for Hamilton. His right rear was completely worn out - a white line appearing around its circumference - as he battled to stay in front of Alonso on lap 30. And coming into the pits, the rear of the car twitched away from the Briton as he tried to turn into the left-hand corner at the start of the pit lane. Hamilton corrected it, but the car slid straight on into the gravel trap, where it was beached. 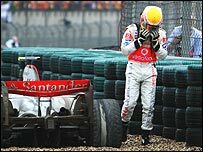 Hamilton tried to get the car out, but the rear wheels spun helplessly and, after imploring the marshals to help him, he finally admitted defeat and climbed out of the car. Back on the track, the action was just as dramatic. After Alonso came in for dry tyres on lap 32, he returned right in front of Ferrari's Felipe Massa, who had been running on his dry tyres for some laps and had more grip. However, once he had cemented his position, Alonso began to carve into Raikkonen's lead, cutting it from more than 15 seconds to eight within eight laps before the Ferrari driver responded to stabilise the gap. Raikkonen controlled the race for the remaining laps to take his fifth win of the season - one more than either Hamilton or Alonso, a fact that could be crucial at the final race. Drivers tied on points at the end of the season are separated by a win countback. Toro Rosso's Sebastian Vettel finished fourth ahead of Honda's Jenson Button after both drove superbly in the difficult conditions to take their best results of the season. Vettel's result came after the novice was reprimanded for causing an accident behind the safety car in Japan. Has Hamilton blown his chance?